When Iron Man was released in 2008, fans were abuzz. Not just because it was a surprisingly good movie but also because of that one little scene that came after the credits. It’s that scene where Tony Stark enters his home and sees Nick Fury standing mysteriously in the shadows. Nick Fury then asks Tony if he thinks he’s the only superhero out there. He then continues by informing him that he’s unwittingly become part of a bigger… universe. When Tony asks who he is, he then introduces himself and starts to tell him about the Avengers Initiative. And right then and there, fans were blows away. Comic book fans suddenly became aware that Iron Man was just the beginning of something big. It was the start of the Marvel Cinematic Universe. When everything culminated with Earth’s Mightiest Heroes joining forces in The Avengers, Hollywood took notice. There was big bucks to be made with the idea of a cinematic universe and other movie studios wanted in. All of a sudden Warner Bros. launched their own thing with the DC Extended Universe in the hope to capitalize on what Marvel started. Even Sony, who only had the license to Marvel’s Spider-Man’s characters, tried to create one of their own by planning out a Sinister Six film. But it wasn’t just superheros films that wanted to assemble their own cinematic universe anymore. The upcoming Mummy film with Tom Cruise isn’t just a reboot of the 1999 Mummy series of movies. It’s slated to be the first film in the Universal Monsters shared universe. Even the most recent American Godzilla film was the launchpad for their own kaiju-like cinematic universe, aptly named MonsterVerse. Kong: Skull Island’s after credits scene strongly hints that Rodan, Mothra and King Ghidora are going to be getting in on the action soon. For today’s movie going audience fans, this seems a little overwhelming as more and more movie producers are going the cinematic universe. For them, it’s a totally innovative way to get people watching their movies without them just releasing sequel after sequel. It’s totally ingenious way to make films as it links different movies together. But, while it may seem like a incredibly fresh idea, it’s actually an amazingly old idea. In fact, movies, television shows and even comic books have been doing this kind of thing long ago. Remember I mentioned the Universal Monster shared universe that’s going to start with the new Mummy film? Well, that’s not just a reboot of the Mummy franchise; it’s also a hard reboot on the entire Universal Monster movie film franchise of old! 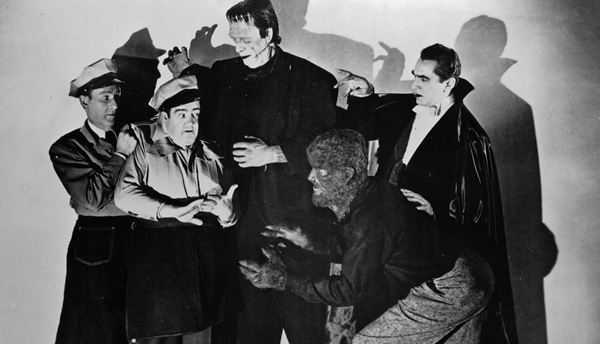 Universal used to have Dracula, Frankenstein’s monster and The Wolfman share the silver screen together fairly frequently before. I didn’t know Abbot and Costello were movie monsters? And while it seems like some weird experiment to have a lot of superheroes share the spotlight in one feature length film, most casual fans forget that, to comic book readers, seeing the likes of Superman, Batman and other larger than life characters in the same book isn’t anything special. Before the Justice League even hits the silver screen, comic book fans were already getting their fill with heroes doing a crossover with other heroes in different books. Okay, it’s much easier to do in the comics as all you have to do is draw them in the same book. DC’s very own Extended Universe is technically playing catch up with themselves as most kids who grew up in the ’70s, ’80s and beyond have seen their greatest heroes join forces on television before. In the ’70s and ’80s, there was the Hanna-Barbara Saturday morning cartoon called the Super Friends, which was great for its time. But things really got good when the Cartoon Network started showing the superb Justice League and Justice League: Unlimited animated series. Heck, I would tell some fans to just watch the old Justice League cartoons since they were much better than Man of Steel and Batman v. Superman: Dawn of Justice! Honest to god, those cartoons were the best! And the entire Godzilla and the MonsterVerse? Well, that was practically the point of the old Japanese kaiju flicks! It wasn’t a big thing to see Godzilla duke it out with Rodan and Mothra then. But it does seem like moviegoers today are ignorant of that fact as it may seem like a huge deal to them. The idea of watching Godzilla face off against King Kong may seem like a novel idea but, well, Japan already did that way back in 1962 with King Kong vs. Godzilla. Even television shows love to get in on the act as well. In fact, if you really think about it, spinoffs can be thought of as some kind of shared universe. Cheers and Frasier are technically part of a grand shared universe. Angel got his own show after his stint on Buffy The Vampire Slayer. When Denise from the Cosby Show went to college, we got to see (somewhat) what happened to her in A Different World. And Happy Days… well, it spun off a whole crap ton of shows like Mork and Mindy, Laverne and Shirley and, of course, the much maligned Joanie Loves Chachi. But you don’t need a show to link up with another show via the spinoff scenario. Sometimes, you can just have shows crossover with each other because you can. The Golden Girls house was just a few feet away from the house in Empty Nest. Everybody Loves Raymond and The King of Queens also share the same universe. A lot of Disney and Nickelodeon programs definitely shared the same universe. But my favorite television shared universe has to be the one that managed to combine Friends, Mad About You and, of all shows, Seinfeld. Yeah, you probably know about Lisa Kudrow playing Ursula in both Mad about You and Friends. But I bet you didn’t know that Kramer was given his apartment by Paul Buchman from Mad About You! Which makes it kind of insane that there was a scene in Seinfeld where George was watching Mad About You… try figuring that out! Now, just because the idea of shared universes is actually an old trick, that doesn’t mean that they aren’t awesome. I’m just calling out the people that think this is a revolutionary idea. Shared universes are indeed awesome, but it isn’t as revolutionary as you may think. What’s your favorite shared universe? Let me know in the comments section below!